The Rev. 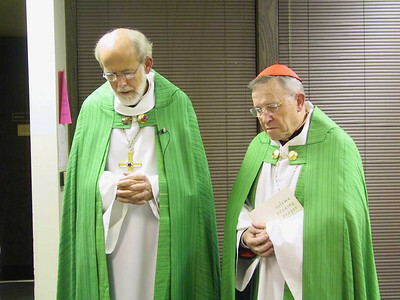 Mark S. Hanson, left, ELCA presiding bishop, and Cardinal Walter Kasper, The Vatican's chief ecumenical officer, pray before leading a "Solemn Evening Vespers" service Oct. 1 at St. Luke's Lutheran Church, Park Ridge, Ill. The ELCA Conference of Bishops, ELCA synod vice presidents, ELCA seminary presidents and St. Luke's members attended. 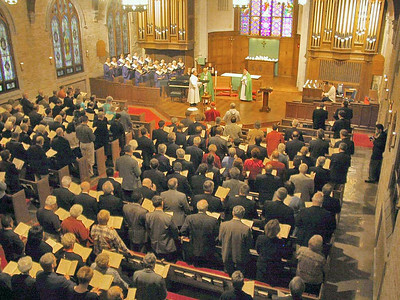 The ELCA Conference of Bishops, ELCA synod vice presidents, ELCA seminary presidents and St. Luke's members attended a "Solemn Evening Vespers" service Oct. 1 at St. Luke's Lutheran Church, Park Ridge, Ill. Guest preacher was Cardinal Walter Kasper, The Vatican's senior ecumenical officer. 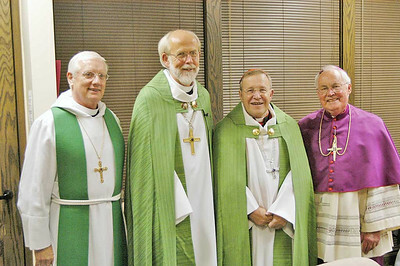 Kasper visited the ELCA churchwide offices in Chicago to mark the fifth anniversary of the signing of the Joint Declaration on Doctrine of Justification in Augsburg, Germany. 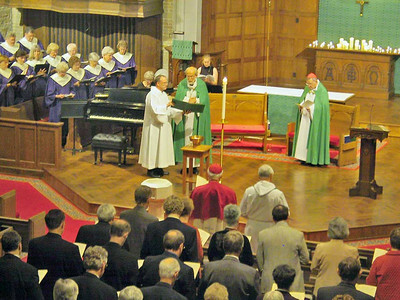 The ELCA Conference of Bishops, ELCA synod vice presidents, ELCA seminary presidents and St. Luke's members attended a "Solemn Evening Vespers" service Oct. 1 at St. Luke's Lutheran Church, Park Ridge, Ill. Guest preacher was Cardinal Walter Kasper, The Vatican's senior ecumenical officer, right. From left is the Rev. Michael L. Burk, ELCA director for worship, and the Rev. Mark S. Hanson, ELCA presiding bishop. 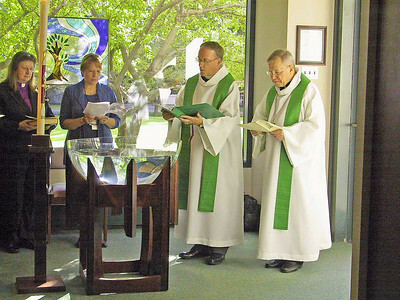 Kasper visited the ELCA churchwide offices in Chicago to mark the fifth anniversary of the signing of the Joint Declaration on Doctrine of Justification in Augsburg, Germany. Cardinal Walter Kasper, right, and the Rev. Michael Burk, ELCA director for worship, open a worship service at the ELCA churchwide offices in Chicago Oct. 2. 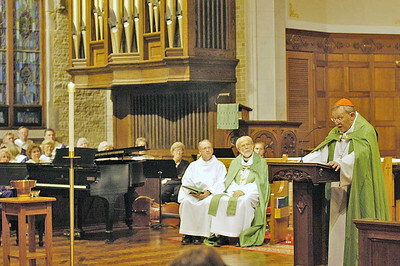 Kasper was guest preacher at the service, which included ELCA bishops, synod vice presidents and seminary presidents. Kasper visited the ELCA and spoke to the Lutheran leaders about the Joint Declaration on the Doctrine of Justification. October 31 is the fifth anniversary of the signing of the Joint Declaration.